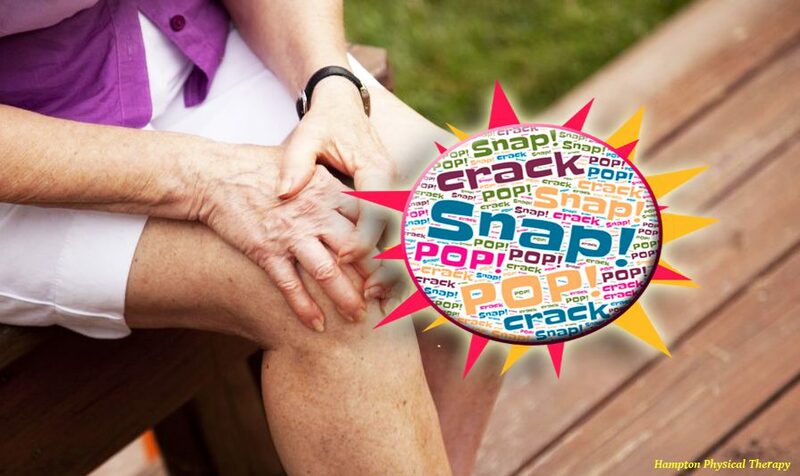 Have you ever heard a pop or a crack in your knee when trying to get down on the floor? Or maybe you heard some noise in your elbow one morning when you picked up your coffee cup or even a little click in your shoulder when you reached over to your alarm clock? The sounds you are hearing are called “crepitus”. Crepitus is the pop, crack, or click sound that you hear from your joints with movement. Crepitus is commonly caused by air making its way into soft tissues that surround your joints. 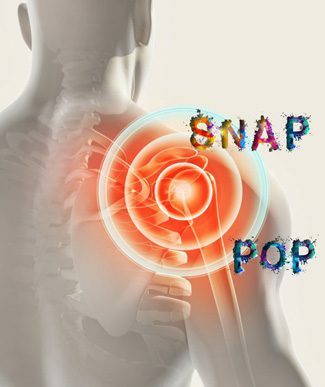 When you move your joints and use the soft tissues, the air pockets can “pop” causing an audible sound (1). Crepitus can start following an injury such as fall, after an increase in activity level, or from repetitive use. These sounds can be considered normal, and if you do not have any pain they can be considered harmless! Crepitus can be painful in some instances. Below are a few common instances where crepitus can be painful. Both your hip and shoulder are considered ball-and-socket joints, and are structured to allow movement in multiple directions. The “socket” portion over these joints is lined with cartilage to deepen the socket and allow for more joint congruency. This cartilage is called your labrum. Dysfunction or damage to either labrum can cause painful crepitus that would feel “deep” in the joint (2). According to the Arthritis Foundation, osteoarthritis is the most common chronic condition that affects the joints, and although osteoarthritis can occur at any age, it is more common in people over the age of 65. In healthy joints, the ends of each bone are covered with cartilage, which allows for smooth, pain-free movement. With osteoarthritis, the cartilage is broken down, which can cause painful, noisy movement. Myth Buster! It was previously believed that purposely cracking the knuckles in your hands and fingers could lead to osteoarthritis. Recent research suggests that there is no relationship between regular knuckle cracking and osteoarthritis (4). As previously mentioned, sometimes air can make its way into the soft tissues around the kneecap (1). When this happens, when you bend your knee to sit down, squat to pick something up off the floor, or climb up some stairs, the air pockets can pop, causing an audible sound. If you have pain with these activities or pain with the popping sound, it may be caused by muscle imbalances or by tight or irritated structures around the knee. What should I do if I have painful crepitus? If you have painful crepitus, the first step is identifying the cause of the crepitus. You may have tight muscles that need to be stretched, weak muscles that need to be strengthened, or a neuromuscular system that needs to be revamped (balance training, specific muscle recruitment, etc.). Or maybe you just may learn new techniques for activities that cause pain, such as lifting something off of the floor. What If I do not know where to start? Come to physical therapy! New Hampshire is a direct access state. This means that many patients can come to physical therapy without a physician referral for problems related to the musculoskeletal system! If you have crepitus associated with pain or feel that you are limited with your everyday activities, let us help! We can help uncover the route of your crepitus, and establish a plan to get you feeling better! Along with education for the best stretches, strengthening, neuromuscular exercises, and activity modifications for you, we are skilled in multiple manual intervention techniques (soft tissue mobilization, mobilizations/manipulations, dry needling, etc) that may provide relief and speed up your recovery! Call Hampton Physical Therapy and schedule an assessment at either our Hampton or Seabrook location! “Crepitus (Joint Popping).” Aurora Health Care, www.aurorahealthcare.org/services/orthopedics/conditions/crepitus. Accessed 12/02/2017. “Labrum” MedicineNet.com, www.medicinenet.com/script/main/art.asp?articlekey=18656. Accessed 12/02/2017. “Arthritis.” Aurora Health Care, www.aurorahealthcare.org/services/orthopedics/conditions/arthritis. Accessed 12/02/2017. “What is Arthritis?” Arthritis Foundation, www.arthritis.org/about-arthritis/understanding-arthritis/what-is-arthritis.php. Accessed 12/02/2017.